Pop-up stores seem to be popping up everywhere. The national retail vacancy rate is at a three-year high, so these temporary shops dropped into empty spaces have become an attractive option for both business owners and landlords. “It’s a great way to market your products or your real estate,” says Christina Norsig, CEO of PopUpInsider.com, a site that lists available pop-up locations. Vintage clothing store owners are also finding way’s to attract new customers by setting up a Pop-Up Shop in a different neighborhood or city. 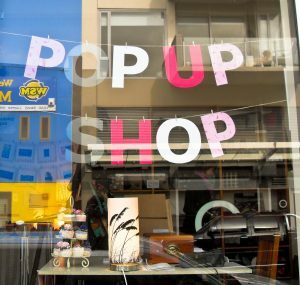 Even online vintage stores that do not actually have a brick & mortar location are using Pop-up Shops to help move their merchandise and get brand exposure as well. Here are four reasons entrepreneurs are opening pop-up stores. In one weekend, the company sold $1,000 worth of artist-designed T-shirts and sweatshirts; $200 of that was donated to a local charity as part of the company’s dedication to charitable causes. After Revilla and Grumbine purchased signage, food, and office supplies, their costs for the event totaled just $150 — plus a few T-shirts. The landlord let the founders use the space in exchange for a couple of shirts. Two weeks before New York City’s International Contemporary Furniture Fair in May, Cheri Caso began hunting for space to exhibit the modern housewares she sells through her online store, Merchant No. 4. At first, she considered renting retail space, but she didn’t have much time to shop around, and the landlords she spoke with were asking for thousands of dollars. Luckily, a friend who owns an architecture firm agreed to let Caso set up shop in the firm’s office. The company was getting ready to move and had unused space in its fourth-floor loft. Caso had two goals: to gain attention for her website during a time when many design fans would be in town and to sell some products she no longer carried on the site. “We have a lot of odds and ends that are just taking up space in our storage area,” she says. By 2007, Bobby Kim and Ben Shenassafar had built a cult following in Los Angeles for The Hundreds, a clothing company influenced by the styles of California skateboarders. Kim and Shenassafar had a store in the city’s Fairfax district and were looking to expand into other cities. Their first target was San Francisco. Opening a pop-up store seemed like a cost-effective way to gauge interest, so they teamed with several other brands to rent a gallery for a day. After the success of that pop-up store, The Hundreds opened a permanent retail space in San Francisco in 2008. In 2009, The Hundreds opened its own weekend pop-up store in New York City. The event turned a small profit, even with $7,000 in costs. “Not only did we make a little money and move product,” says Shenassafar, the company’s CFO, “but we were able to market the brand in an area where we didn’t have a lot of penetration.” That persuaded Kim and Shenassafar to open a third store, set to debut in Manhattan this summer. For about a year, Dorie Greenspan, a popular cookbook author, and her son, Josh, had discussed opening a cookie shop in New York City. But permanent retail space in the city is pricey, they discovered — as high as $1,725 per square foot per year for prime space. Before making a big financial commitment, the mother-and-son team wanted to make sure that people would come. “We needed to figure out if we could physically do this and if people would buy the cookies,” Josh says. In late 2009, Josh approached a friend who owned a Manhattan salon and pitched him on the idea of selling cookies there during the days leading up to Valentine’s Day. The friend agreed to let the Greenspans use the space for free. He merely asked that they pay the associated fees if they used the salon’s credit card swiper. The Greenspans spent about $1,600 to rent a commercial kitchen in Long Island City, in New York’s borough of Queens, to bake the cookies and set up a small table inside the salon, near the entrance. A few fans of Dorie’s volunteered to help bake after she publicized the event on Twitter. Time Out New York and several food blogs covered the event. In six days, the Greenspans sold more than 4,000 cookies. “It was far beyond anything we expected,” Josh says. Some creative shops are even doing Mobile Pop-Up Shops out of an old airstream trailer or bus. This way they can set up an event or outdoor fair. Some vendors even pull up to hot-spots like a Food-Truck would, taking their merchandise directly to the consumer at their lunch breaks or at night when they waiting to enter a restaurant or a venue to see a band. Whether you are moving into a temporary location or setting up a mobile shop, the sky is the limit when creativity has no boundaries. Term. Typically 1 day to 3 months. Location. High foot traffic areas such as city centers, malls, and busy streets. Price. Much lower than a traditional store; typically paid upfront. Use. Sell products, presence during holidays or events, launch new products, generate awareness, move inventory, test idea or location, increase ‘cool’ factor. Connect with customers: The pop-up retail format allows you to personally get to know your customers and build stronger relationships. Sell more: About 95% of all purchases are still completed offline. This is your opportunity to take advantage of the retail channel. Test new markets: Easily enter a new market and launch new products.